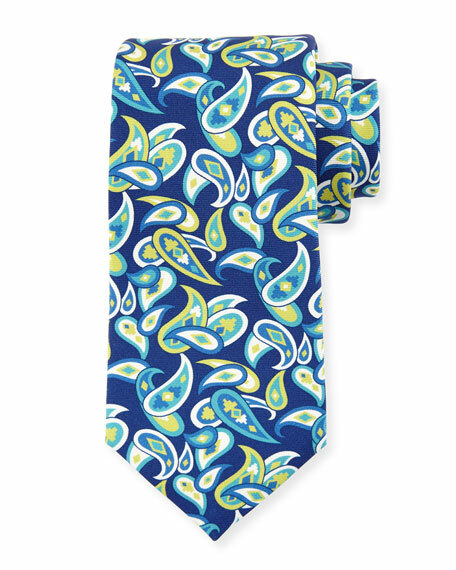 Ermenegildo Zegna tie featuring large paisley motif. Approx. 57"L; 3.5" at widest. Silk; dry clean. Made in Italy. Ermenegildo Zegna tie featuring paisley motif. Approx. 57"L; 3.5" at widest. Silk; dry clean. Made in Switzerland. Ermenegildo Zegna Quindici silk tie with hand-printed paisley pattern. The tail end of a Quindici tie features its hallmark: the actual screen rotation used to finish each and every design. 3.5" at widest. Dry clean. Handmade in Italy. Ermenegildo Zegna tie featuring tonal paisley. Approx. 57"L; 3.5" at widest. Silk; dry clean. Made in Italy.